You were a joy in my life for 12 glorious years. You were the consumate Scottie- totally fearless, always loyal, constantly curious, usually stubborn, and had a hundred pounds of serious attitude in that 21 pound body of yours. You never did trust strangers, large groups, or unfamiliar folks, but, my child, you were my shadow, devoted, loving, and always faithful. You were a wonderful watch dog-- and , yes, they did know that you meant what you said! You loved all "people food" , especially sweets, fruits, and vegetables. You adored Chinese fortune cookies above all else. You loved traveling down the highway, watching for large trucks to bark at as they dared to pass your car. 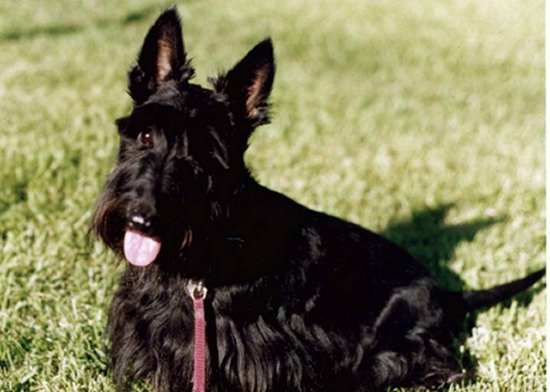 You slept curled against my legs at night, stood watch at the window for evil doers and bicycles, constantly exercised that glorious Scottie voice of yours, and were a treasure in my life. Farewell, my Pris angel, you are surely missed. Enjoy the meadows across the Bridge.